The high end audio world is made up of “components”. Some companies design and build cartridges, some build phono preamplifiers, others build preamplifiers, amplifiers or speakers. It is rare that a company and a designer considers an entirely new “true systems” approach to audio reproduction, and starts from scratch with a “clean sheet of paper”. Dr. Kubo has done this with Haniwa … it was designed as a totally new approach to audio. While he was designing the analog front end of the Haniwa audio system, he developed new technology that overcomes problems that exist in every other system on the market while extracting all of the music from the record groove with pristine accuracy and detail. 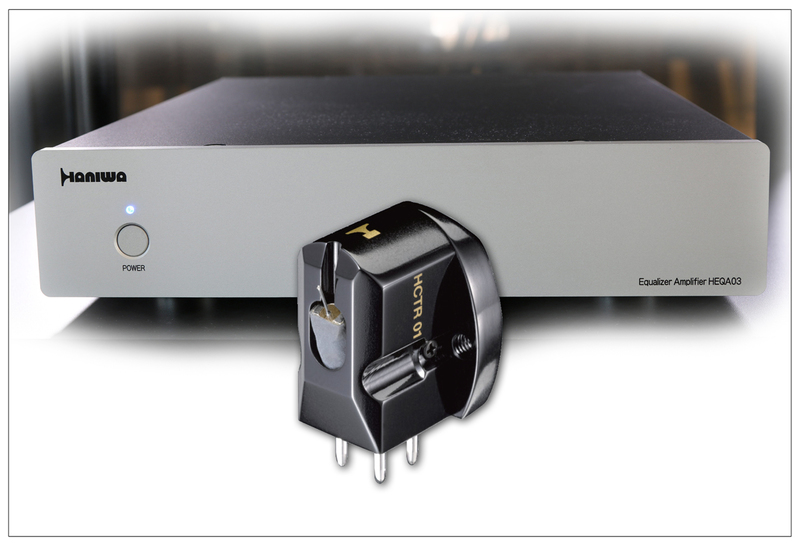 The system includes the HCTR01 Mark II Moving Coil cartridge and the HEQA03 phono stage and is the result of our long-term effort to deliver an order of magnitude improvement in detail and sonics from your treasured LP records. Our singular objective is to play music contained in the LP grooves exactly as it was recorded, and ultimately deliver the original live performance to you in your listening room. Haniwa has solved fundamental problems that have eluded audio system manufacturers in the past. For many years, audio system designers have traditionally focused only on stability and impedance/inductance of cartridges. Haniwa not only solves this problem, but goes much further to provide a solution to the least argued but most critical issue: removal of signal distortion that occurs in the current loop circuit. The job of a phono preamplifier is to capture and amplify the tiny signal generated by small, dynamic motions of the cartridge needle in the record groove so it is strong enough to feed into the main audio system. Physics tell us that inside the electrical circuit of the phono preamplifier, the signal waveform is severely deformed when it passes through the current loop. This deformation is inevitable since pulse motions of a cartridge needle tracking in the record groove are always followed by counteractive motions in the opposite direction. In addition to this problem, the coil in the Moving Coil cartridge has its own inductance which further degrades the waveform. Both of these critical problems have essentially been ignored by the audio industry, and Haniwa solved them by designing the cartridge and the phono stage as one consolidated system. 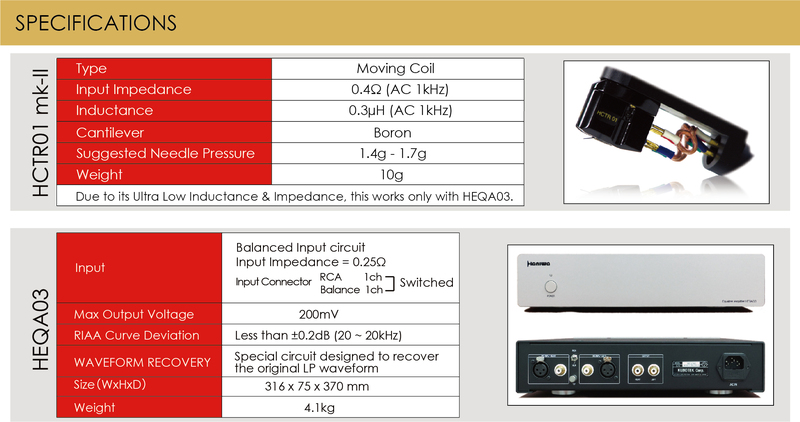 The HEQA03 phono stage contains a proprietary Waveform Recovery Circuit which removes the signal distortion generated by both the counter movement of the needle and the added coil inductance. The result is easily audible when you listen to your own music on Haniwa … your hear increased clarity, detail and sonics that are far superior to other systems on the market. The Haniwa HCTR01 Mark II cartridge is elegant in its simplicity of design for form and function. Its appearance is like a jewel in classic gloss black that hides the function of a new and radical approach to analog playback. It was designed as a system from the very beginning to have the lowest possible impedance and inductance while working with a matching phono preamplifier designed solely to handle the characteristics of this unique signal. The result is a vinyl playback system with the highest sensitivity, resolution and dynamics on the market. Why design a new approach to vinyl playback? 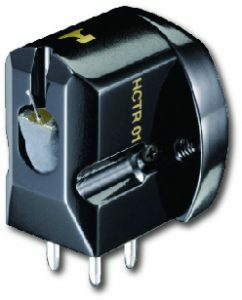 Most Moving Coil or “MC” cartridges have high voltage output and thus high impedance and inductance to achieve this output level. These values cause much higher distortion of the output signal waveform. Because of this, we set out to develop a new cartridge with the lowest possible impedance & inductance. The result is the Haniwa HCTR01 Mark II cartridge. It uses a moving coil of almost zero impedance and inductance (0.4Ω and 0.3µH,). Due to this fact, it required a current based phono preamplifier instead of a typical voltage phono preamplifier. The HCTR01 mark II is capable of retrieving all of the music hidden deep inside record grooves to precisely capture the entire signal without missing any detail. In order to build the worlds best analog front end system, the Phono Preamplifier needed to have the ability to handle the unique music signal produced by this cartridge. We built a current receiving circuit, not the typical voltage type, to form a current loop circuit with the receiving circuit having the lowest possible input impedance of 0.25Ω. At the same time, in order to make the current signal in the loop a large as possible, the tonearm wires connecting the cartridge to the phono preamplifier, should have the lowest possible impedance. In the case of the Haniwa system, when impedance of all components in the loop are totaled, the loop impedance is as low as 0.8Ω. This result is an order of magnitude lower than other current based phono amplifiers on the market which have a typical loop impedance of 80Ω or more. Our research has shown that when the loop impedance is lower than 1Ω, system sensitivity increases and rising edge detection is dramatically improved. What this means to your ear is ultrafast dynamics reproduced exactly as it exists on the LP. However, there is an essential problem of using a current loop approach when designing a MC cartridge with a current based phono preamplifier. Even with a highly sensitive current loop, the signal waveform is distorted at the very coil, due to the inductance of the coil. That distortion is further deteriorated as it runs through the current loop. Haniwa developed a unique solution to this difficult problem consisting of a special waveform recovery circuit in front of the input to the RIAA equalization circuit. 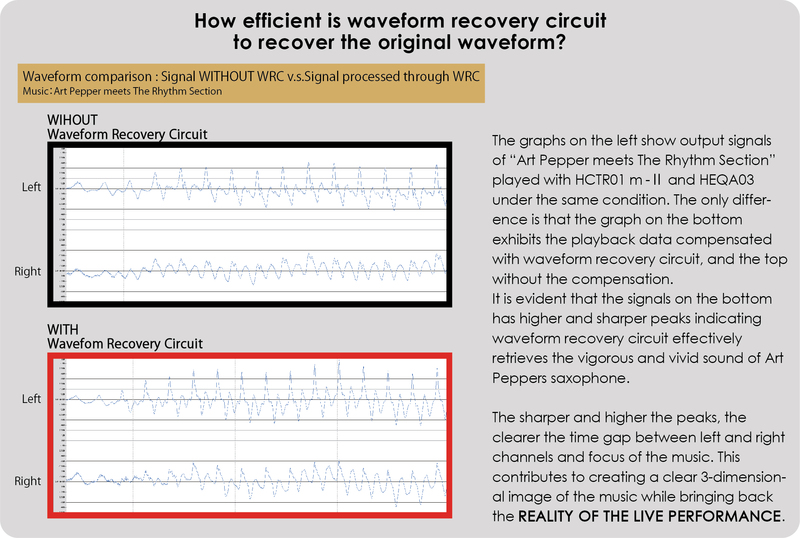 Haniwa is the only system in the world with a waveform recovery circuit designed to remove distortion at the front end of current loop circuit, and recover the music from the original signal in the record groove. The new Haniwa approach audio reproduction can sound complicated, but in truth, it simply means that the music on the record grooved is accurately and precisely reproduced. We believe that Haniwa accurately delivers an order of magnitude improvement in detail and sonics from your LP’s.